Polyphemus – The brainchild of the late Brian Leary (aka Rafe Atkinson), and Elvira Corral with Damian Lautiero, Mike Riddle, and Tony Brown Diprima. They created a complex sonic template rooted in psychedelic punk, like Husker Du meets the Who. 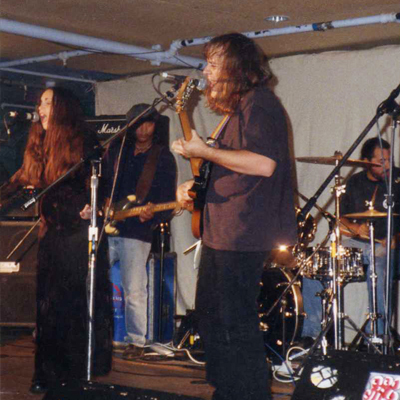 They remain one of the most unique bands to come from the desert’s raging music scene in the 90’s. Other members included Mike Riley (Parosella) and Ian Taylor. Multi-instrumentalist and musical visionary, Brian Leary passed away in 2013 sending a wave of sadness throughout the CV desert rock community.